Find out what it takes to be an entrepreneur, and the steps for setting up a business. How do I come up with a bright idea? We often hear about successful Kiwi entrepreneurs like Sam Morgan, founder of online trading website Trade Me, but what does it really take to turn a bright idea into a successful business venture? 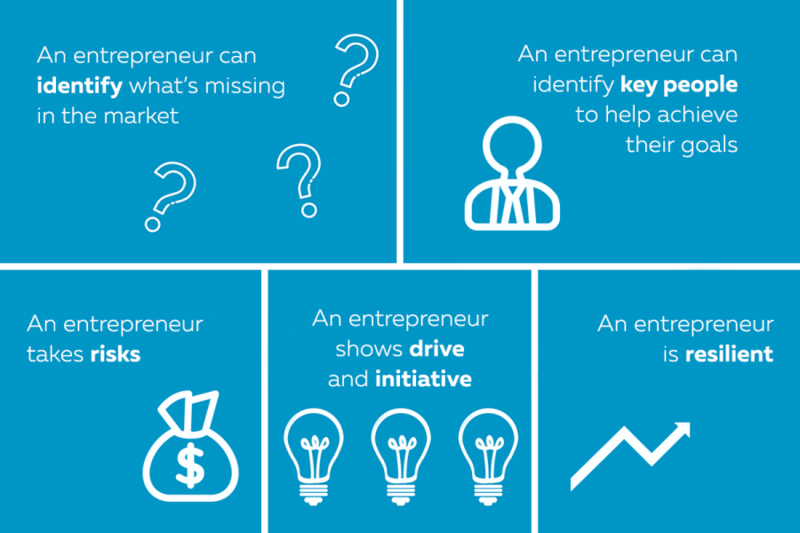 Find out what makes an entrepreneur, how to generate ideas for a business, and where to go for advice on getting a startup off the ground. Gustavia Lui talks about her experience as an entrepreneur since starting her footwear business, Staavias. (Video - 5.37 mins). Gustavia: Island feet. Island feet is like feet that are very long and very wide and kind of flat. Hmm, island feet. I am Samoan and Tuvaluan. I love shoes. I definitely love shoes and I love helping people. So I was doing a course with Te Wānanga and the idea of business came up. The very first thing that came to my mind was I’m going to open a shoe store. I actually decided to roll with it after that. I thought "I want to see if it can be done." I have problems finding shoes myself. I have quite big, wide feet. I struggled so much finding shoes that I like. There were shoes that were big but they were never trendy. So I wanted to bring in some real hip, trendy, kind of shoes. I wanted something that fit my feet and so that’s why I was quite focused, determined, on the big shoes idea. So my upbringing was quite difficult. I got kicked out of school. I lived in a whole lot of different homes growing up. I got pregnant when I was 16 so I was a mum quite young. I got married. Now I’m stable, I have a good working history, I have three children, and I’ve been married for a long time. One of the biggest things is attitude. Your attitude will determine how you look at a problem, whether or not you’re going to face it and try to overcome it, or you’re going to give up. I read books a lot, so I’m always reading new books. I read a lot of self-help, business/marketing kind of books. I’m just reading, there’s a book over there that I’m just currently reading. So that’s working on my attitude as well. One of the things is that you’ve got to be willing to learn. For example, when I first started I had no idea how to do a website. I know what a website is and that’s about it, like I only know what a website is. Now I’m able to do basic coding. I get a lot of people write to me about how they don’t agree with my prices. They write to me and they say things like "You’re trying to rip off our community", "You’re a Samoan, who do you think you are selling $200 shoes to Islanders?" You know, that sort of thing. Johnson: How do you deal with that? Gustavia: I usually write about it, just on my own. I will write a whole note about this person and how they made me feel. And usually once that’s done, it’s done. My achievements and cool stuff that’s happened to me in the last 12 months. The first thing I did was I started the brand, so I got it open. I’ve been featured in The Herald and 22 other publications, blogs, articles – including one by Shopify in Canada. I’ve been to Australia, Hong Kong, China, and America. I’ve lasted a whole year, that’s a big achievement. By the end of 2017, I have a goal to make sure that we have shoes in Vienna, Spain, France, and every state of Australia. Oh, 2017 is super exciting. Kia ora whānau, I hope that Gustavia’s determination has inspired you. Here’s some awesome tips that we’ve taken away from her business journey so far. Gustavia’s business idea came from a lightbulb moment at Wānanga and although she wasn’t a savvy businesswoman yet, she didn’t say no to that voice in her head. Gustavia: So I was doing a course with Te Wānanga and the idea of business came up. The very first thing that came to my mind was I’m going to open a shoe store. Johnson: Don’t be that person who says "I thought of that idea five years ago." It’s the doers that take a chance at success and turn their dreams into reality. Gustavia didn’t have a heap of money, well actually she didn’t have any money or a website when she first got started. Gustavia: The first thing I did was I started the brand, so I got it open. Johnson: You don’t have to wait for perfection, or next year, to get started on your goal. Whether it’s to study, start a business, or apply for a new job, you can solve any hurdle that comes your way with determination and a great attitude. We grow our muscles in the gym and our minds when we study and learn. But how often do we invest in our attitude, mind-set, and self-awareness? Gustavia: I read books a lot, so I’m always reading new books. I read a lot of self-help, business/marketing kind of books. Johnson: There are heaps of free tools online to help you grow yourself. More Oompher stories are a great place to start. Faafetai lava to you Gustavia for sharing your extraordinary story. Don’t forget to subscribe to our channel and check out more extraordinary Kiwi stories. can identify key people to help achieve goals – nobody is an expert in everything! is resilient – all entrepreneurs have failures and successes. Your ability to learn from mistakes and move on is key to the success of your business. gap analysis - problem solving by finding the gaps between what people need and what is actually available. Steven Johnson explains where those good ideas come from. (Video - 4.06 mins). Steven Johnson: For the past five years I've been investigating this question of where good ideas come from. It's a kind of problem I think all of us are intrinsically interested in. We want to be more creative, we want to come up with better ideas, we want our organisations to be more innovative. I've looked at this problem from an environmental perspective. What are the spaces that have historically led to unusual rates of creativity and innovation? What I found in all these systems, there are these recurring patterns that you see again and again that are crucial to creating environments that are unusually innovative. One pattern I call the "slow hunch", that breakthrough ideas almost never come in a moment of great insight and a sudden stroke of inspiration. Most important ideas take a long time to evolve, and they spend a long time dormant in the background. It isn't until the ideas has had two or three years – sometimes 10 or 20 years – to mature, that it suddenly becomes successful to you and useful to you in a certain way. And this is partially because good ideas normally come from the collision between smaller hunches, so that they form something bigger than themselves. So you see a lot in the history of innovation cases of someone who has half of an idea. There's a great story about the invention of the world wide web and Tim Berners-Lee. This is the project that Berners-Lee worked on for 10 years but when he started he didn't have a full vision for this new medium he was going to invent. He started working on one project as a side project to help him organise his own data. He scrapped that after a couple of years and he started working on another thing and only after about 10 years did the full vision of the world wide web come into being. That is, more often than not, how ideas happen. They need time to incubate and they spend a lot of time in this partial hunch form. The other thing that's important when you think about ideas this way, is that when ideas take form in this hunch state they need to collide with other hunches. Often times the thing that turns a hunch into a real breakthrough is another hunch that's lurking in somebody else's mind and you have to figure out a way to create systems that allow those hunches to come together and turn into something bigger than the sum of their parts. That's why, for instance, the coffee house in the Age of Enlightenment or the Parisian salons of Modernism were such engines of creativity because they created a space where ideas could mingle and swap and create new forms. When you look at the problem of innovation from this perspective, it sheds a lot of important light on the debate we've been having recently about what the internet is doing to our brains. Are we getting overwhelmed with an always-connected multitasking lifestyle and is that going to lead to less sophisticated thoughts as we move away from the slower deeper contemplative state of reading, for instance. Obviously I'm a big fan of reading, but I think it's important to remember that the great driver of scientific innovation and technological innovation has been the historic increase in connectivity and our ability to reach out and exchange ideas with other people and to borrow other people's hunches and combine them with our hunches and turn them into something new. That really has, I think, been more than anything else the primary engine of creativity and innovation over the last 600 or 700 years, and so yes it's true we are more distracted, but what has happened that is really miraculous and marvellous over the last 15 years is that we have so many new ways to connect and so many new ways to reach out and find other people who have that missing piece that will complete the idea we're working on, or to stumble serendipitously across some amazing new piece of information that we can use to build and improve our own ideas. That's the real lesson of where good ideas come from – that chance favours the connected mind. Once you’ve gone through the brainstorming process and come up with or refined your business idea, it is time to check out the competition. All trading companies in New Zealand are required to register with the New Zealand Companies Office. You can search the office’s website for company details. A business mentor is an experienced business professional who provides you with advice, guidance and support as you launch and maintain your business venture. Having a mentor will boost your business’ performance, and increase your chance of success. challenge you to set goals for your business that may achieve better results. A number of organisations have business mentoring programmes. Some organisations offer business incubators or accelerators. These help businesses that are starting up by providing services such as business advice, finances and access to shared premises. Jeremy Moon, Kathryn Wilson, Shelley Campbell, Antony Healy, Mahe Drysdale and Sarah Walker discuss the value of mentors in all stages of your career, and tips for the best ways to find a mentor who is helpful and inspiring. (Video - 2.08 mins). Jeremy: I rang people I went to university with and said "I’ve got this idea who do you know who could help?" Sarah: It’s important to have someone who inspires you that is I guess within reach. Anthony: What I’ve just found as you move through life and you move through your career you meet lots of people and you connect with so many and you don’t connect with others. Mahe: If it’s someone you really look up to and you want some advice from them, and that’s when maybe you don’t know them you might need a formal approach. Kathryn: Sometimes if you just say "can I buy you coffee for 20 minutes, and I promise 20 minutes", they might hear you out. Shelley: Use the wisdom of other people around you. I can remember some of my early CEOs and chairpeople, if you ask them they’re really willing to give you the time and the energy and to sit down with you. Anthony: Often it will be great entrepreneurs and those people that have achieved extraordinary things starting with nothing and you learn they have lots of life lessons that you can learn from. Jeremy: There was this amazing group of people who might be a bit older. I was 24 they were in their 50s; they had kind of been round the block and they wanted to help, had all this experience and they could see that I was in a mission. Kathryn: You never know what’ll come up in those conversations and the way it’s more of you tell where you’re at and having a clear vision of what you want out of the conversation and they might go away and think about it and a week later email you and say "I’m thinking about this". Mahe: If you’re going to choose one guy or one person that’s going to help you, you know you want to have a huge amount of trust and know that they’ll be there through thick and thin. Kathryn: It’s a privilege in NZ that we’re all accessible. We’re either talking about seven steps of separation, it’s not at all it’s probably more one or two. Mahe: My manager for example, he’s had some tough things to say to me at certain times but we have a relationship that I respect. Jeremy: So, it’s actually easier to attract people into your life who can be inspiring and really helpful. If they can come and see a spark in you that they can relate to. how you expect to run day-to-day operations, and make business decisions. You need enough money to set up the business and cover operational expenses until the business starts to generate a profit. As your business grows, you are likely to hire staff. It’s important that you have a good understanding of employment relations, and health and safety requirements for businesses.